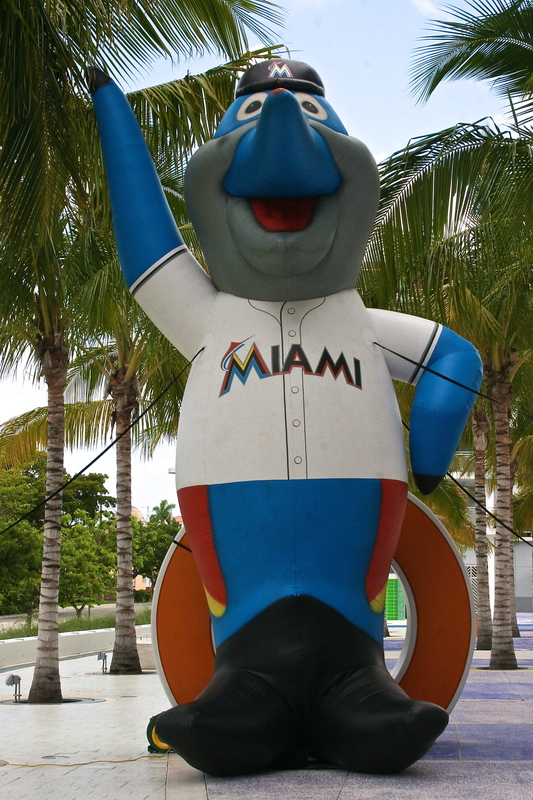 Marlins Park – Where is everybody? This was the park I was most looking forward to visiting while simultaneously having the lowest expectations of any of the stadiums. The Jeffery Loria saga has been well documented in how he has treated the city of Miami and Marlins fans. I was fully expecting a low turnout to the game, but what I did not foresee was how bland Marlins Park actually is. I am trying to find something positive and special about each stadium, but that proved to be quite the challenge here in Miami. Much like Camden Yards had done in the 90s, when Marlins Park opened its doors in 2012 it was supposed to lead the way for the new generation of baseball stadium. Camden Yards this stadium is not. The outside of the stadium (with the roof closed) looked less like a baseball park and more like the docking bay for a space ship. I will get to what I enjoyed about the park in a moment, but what really bugged me was the fact that the roof remained closed for the entire evening. When the Twins moved out of the Metrodome into Target Field I was curious as to why they chose not to include a retractable roof. Being from Michigan and having attended World Series games in Detroit I know first hand how much fun baseball can be in freezing temperatures. I figured that the future of all baseball stadiums was the retractable roof to try and avoid as many weather delays as possible. I have now come to my senses and hope that the only city that keeps a retractable roof for the future is the Seattle Mariners. I could not believe that the roof was closed for today's game. It was 85 degrees out with no rain in the forecast. Sure it was hot and muggy, but this is baseball, unless there is a monsoon outside I want to see the sky. Having the roof as an option is a crutch. Being hot and sweaty at a baseball game makes the beer and ice cream taste like heaven on earth. Inside the park there are things that I think the Marlins did extremely well. The food was ridiculous. I wandered over to the Taste of Miami where I met Guillermo and Lisa at the Latin American Grill. We chatted for a bit about the park and why people aren't coming out. Disregarding the obvious - Loria getting rid of any player whose name you might recognize except for Giancarlo Stanton - I heard similar complaints from the fans in Tampa. Once again traffic was at the top of the list of concerns. Short of providing long distance shuttle services from people's offices to the stadium I don't know how to solve this problem. The saving grace at this park was the food. I had to stop myself from buying something from each vendor I walked past. As the stadium is located in Little Havana, there is no shortage of amazing Cuban food. I settled on having a pressed Cuban sandwich with a side of mariquitas. I made the right choice. I needed to walk around the stadium to work off a little of what I had just ingested, so I went exploring. I couldn’t find any real history or attraction inside except for a case of bobbleheads and a wall dedicated to the Orange Bowl. The upper decks were completely blocked off and many of the stores were shuttered due to low attendance. The park itself is beautiful and colorful, but there is no way to describe the atmosphere other than sad. I realize that a Monday night game between two teams near the bottom of the standings is not the ideal matchup to draw 40,000 plus. That being said this stadium was empty. “How empty was it?” I hear you asking. As I enjoyed my second consecutive game of baseball sans sky I began to talk to my seatmates of which there were only a couple. In front of me was a young gentleman who was friends with Brewers star center fielder Carlos Gomez. Sitting behind me were two sets of couples who were on their own stadium tours. Their tours had taken them years as opposed to the months that mine will take, but we bonded over our shared experiences touring the stadiums of professional baseball clubs. One of the couples started their journey eight years ago and will complete their 30-stadium trek this summer. After discussing our remaining schedules, we realized that we will both be at Miller Park in Milwaukee for the same game and are sitting in the same section once again. I am not a mathematician but the odds of that have got to be pretty low. The odds were about to be challenged once again as the couple sitting next to me asked me where I was from. When I told them that I was from Kalamazoo, a town they probably had never heard of before, they gleefully told me that they too were from Kalamazoo. When I told them that in actuality I am from a small suburb of Kalamazoo called Portage, their jaws dropped as they admitted they too hailed from the same suburb. This young couple had graduated from my rival high school. In an empty stadium on a Monday night in a city nearly 1,500 miles away from my home town I sat next to two kids who grew up 10 minutes from my house. The common theme if you have not caught on yet, is that nobody who was sitting around me was actually from Miami, lived in Miami or were fans of the Miami Marlins. As I am sure you have noticed, I have not typed anything about the actual game yet. This is not an oversight on my part. There is very little to write about the gameplay on the field. Luckily Marlins lone superstar player Giancarlo Stanton was back in the lineup after a lengthy stay on the DL, but there was little else to cheer about during this game. The Brewers jumped on the Marlins early and coasted towards the 9th inning for an easy victory. I may sound as if I did not have any fun at Marlins Park, but I can say with complete sincerity that I have never had a bad day at the ballpark. Even if my team loses, being at the ballpark is better than being anywhere else in the world. The Marlins are a work in progress. I remember going to game in the early 2000s at Camden Yards when their team was drawing crowds in the low 10,000s. Perhaps the stadium will come to life once they can start filling the stands. I honestly hope that the ownership turns it around and figures out a way to bring people out to the ballpark. I don't want to see either the Rays or the Marlins move to a new city, but if something isn't done soon there is a city in Canada that wouldn't mind getting a team back and would love to take the Marlins off Loria's hands for him -- as long as he doesn't come with them.